The extensive collection of NOE constraint data involving the aromatic ring signals is essential for accurate protein structure determination, although it is often hampered in practice by the pervasive signal overlapping and tight spin couplings for aromatic rings. We have prepared various types of stereo-array isotope labeled phenylalanines (ε- and ζ-SAIL Phe) and tyrosine (ε-SAIL Tyr) to overcome these problems (Torizawa et al. 2005), and proven that these SAIL amino acids provide dramatic spectral simplification and sensitivity enhancement for the aromatic ring NMR signals. In addition to these SAIL aromatic amino acids, we recently synthesized δ-SAIL Phe and δ-SAIL Tyr, which allow us to observe and assign δ-13C/1H signals very efficiently. Each of the various types of SAIL Phe and SAIL Tyr yields well-resolved resonances for the δ-, ε- or ζ-13C/1H signals, respectively, which can readily be assigned by simple and robust pulse sequences. Since the δ-, ε-, and ζ-proton signals of Phe/Tyr residues give rise to complementary NOE constraints, the concomitant use of various types of SAIL-Phe and SAIL-Tyr would generate more accurate protein structures, as compared to those obtained by using conventional uniformly 13C, 15N-double labeled proteins. We illustrated this with the case of an 18.2 kDa protein, Escherichia coli peptidyl-prolyl cis-trans isomerase b (EPPIb), and concluded that the combined use of ζ-SAIL Phe and ε-SAIL Tyr would be practically the best choice for protein structural determinations. This work was supported by Targeted Protein Research Program (MEXT) to M.K. and by a Grant-in-Aid for Young Scientist (B) (21770110) to M.T. 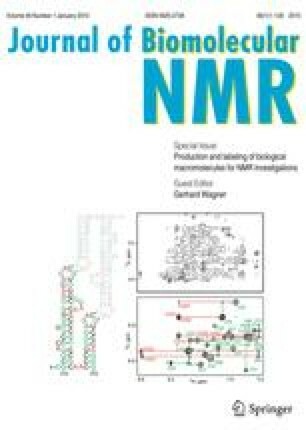 We thank Dr. Frank Löhr and Prof. Volker Dötsch, Institute of Biophysical Chemistry and Center of Biological Magnetic Resonance, University of Frankfurt, for their kind help in collecting the NMR data at 950 MHz.